In the early 1920s, and for more than the next three decades, there was a class of yacht in Australia that sailed in every capital city of every state in keen competition. And yet, there are relatively few modern Australian yachtsmen who would know much about the class, and fewer who could recognise one of these boats. Indeed, it may be safe to say that most would not have even heard of the 21 foot Restricted Class. In its heyday, the 21-footer commanded the attentions of the cream of Australian sailors, and drew skippers, owners, crews and the sporting public together through war and depression in contests that often made front-page reports in newspapers around the country. The evolution of the 21-footers, which started not long after the turn of the century, signalled the coming of age of yacht racing in Australia. Indeed it would not be too long a bow to pull to say that the growth of the Australian 21 ft Restricted Class mirrored the growing national pride of a recently federated nation. Developing up until the turn of the century, and persisting well afterwards, a certain style of boat came to be the norm on Port Phillip that seemed ideally suited to both the bay and nearby coastal areas. Straightforward to sail, inexpensive to build and able to stand up to the worst the weather could deal out, these boats had come to be pretty much the standard both for work and leisure. The well-known couta boats are among these: open cockpit but decked forward of the mast, along the sides and stern, inside ballast with a centreplate, sloop rig with a bowsprit and moderate to shallow draught. It was, and is, a style that seemed most suited to the conditions met with on these coasts, which could include choppy water and sudden wind squalls as well as lighter airs, all on the one day. Not long after 1900, a class of yacht appeared on Hobson’s Bay (at the northern end of Port Phillip) called the 24 foot Square Sterner, which appeared to be comprised of the best characteristics of the established style. These were first class yachts – shallow draughted boats that also had a fair turn of speed in light wind conditions and that were inexpensive to build. But in 1909, local designer and builder Charlie Peel built two smaller versions of these yachts – Namoi, for himself and another member of the Port Melbourne Yacht Club, and Idler, built for the Mayor of Brighton. These two boats, each with a waterline length of 21 feet, proved themselves to be excellent racers as well as displaying the best seaworthy characteristics of the traditional style. The Victorian Yacht Racing Association had, by 1913, decided that a general utility small boat class needed to be established. The association’s aim, put simply, was to promote the sport of yachting to a wider range of people. Given the success of the Namoi and Idler in various races in the bay, the VYRA set about, in April of that year, officially adopting the lines and dimensions of these boats as the basis for a generally accepted, affordable and accessible, racing yacht. However, in setting down the design of the new class, the association opted for a set of restrictions for the craft rather than a ‘one design’. Having this difference allowed for certain variations within a set down list of parameters, and so builders could, and would in the years ahead, adjust some of the finer parts of the hull shape in a quest to get the best out of these boats. Ardale was the first boat built to the new VYRA restrictions, but only three were built before the ‘14 -’18 war put a stop to things for the next few years. Until the class established itself in its own right from the early 1920s, these boats raced with the Six Metres. But in the first few years after the war, and as the nation strove to resume life as normal, several people were keen to see the revival of yachting in Australia. Not least among these was Australia’s Governor-General himself, Lord Henry William Forster. 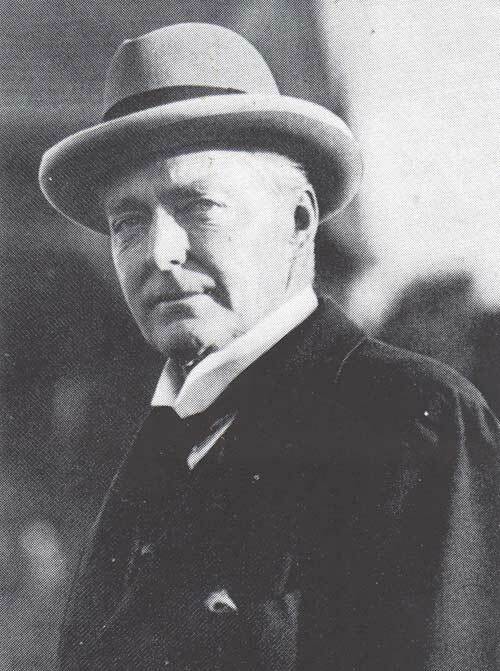 Beginning his term in October 1920, he had been raised to the peerage only shortly before coming to Australia. Fifty-four years old, he had been a member of the British Parliament for 28 years and had lost his two sons in the war. He was a first-class cricketer and also an enthusiastic yachtsman. Federal Parliament sat in Melbourne until moving to Canberra in 1927, and so a great deal of Lord Forster’s vice-regal duties saw him stationed in Victoria. His official residence was therefore in Melbourne (Government House is only a couple of kilometres from the bay), but it seems that Forster spent quite some time in Sydney. He also had residence at Admiralty House, on the shore of Sydney Harbour, which is a stone’s throw from the Royal Sydney Yacht Squadron. Forster immediately became an active member there and was elected commodore in August 1921. He had already accepted office as commodore of the Royal Yacht Club of Victoria, and took an active part in sailing there. Forster (pictured right) had for some time shown an interest in the fledgling 21ft class after seeing Idler out on Port Phillip one very rough day. Angus McIntyre, a member of the Brighton Yacht Club, had taken Idler down to Geelong for a weekend regatta late in the 1919-1920 season, but Monday came blowing a gale. Forster, who attended the regatta, had to return to Melbourne by car on the Sunday, but was concerned about Idler making it back after the wind came up the next morning. Angus, interviewed in 1975 when he was 81, tells the tale: ‘Before midday it started to blow a gale and I got away early with Idler to cross the bay to Brighton. It blew that hard that all the sail I carried was a spitfire (storm) jib abaft the mast. ‘Lord Forster … was very worried about the small craft getting back from Geelong and he went to the top of the tower at Government House with a strong pair of field glasses. He picked up Idler some four or five miles out from Brighton. It so happened that in the same year a W. D. M. (Don) Taylor of Sydney, a fellow member of the Royal Sydney, was in Melbourne and also took a fancy to the 21-footers he saw. The build up of sentiment about putting sailing back on the wider social agenda coalesced into a committee late in 1920. Comprising delegates of the Royal Sydney, the Royal Prince Alfred Yacht Club and the Sydney Amateur Sailing Club, the committee met on 1 February 1921 to decide on a suitable boat for interstate racing. The unanimous decision was that the yacht must be inexpensive and suitable for pleasure as well as for racing. One design put up for consideration was the American Star Class, but the committee found that these boats were too expensive. They were also deemed unsuitable in that they were strictly racing boats, and having a bulb keel were more difficult to slip. The committee seems to have quickly came around to agreeing that the 21 foot Restricted class was suitable in every way. The restrictions (see below) were in fact fairly generous. The sail area of 450 square feet counted only 85 per cent of the fore triangle, and the style of rig was left up to the owner (although the gunter was the preferred rig for the class). The ballast was limited to a minimum 10cwt, and therefore a boat could in theory have any amount of ballast inside as long as the waterline length came to only 21 feet. In no time, five boats were ordered for the Royal Sydney Yacht Squadron. Three of these were built to the Victorian (Charlie Peel) design, with the other two coming from local Sydney designers. These first three, destined for members Forster, James Milson and Frank Albert, were scarcely distinguishable from each other, and so it was decided to draw for them by ballot (from Milson’s hat). Don Taylor threw in his hand with the new commodore, and crewed or, in the owner’s absence, skippered Corella, which Forster drew from the hat, for many years later. The boat was built by Stewart, Sandeman and Co at Careening Cove, Port Jackson. The enthusiastic Forster, who later came to be known as ‘the sporting Governor-General’, immediately donated a perpetual gold trophy for interstate competition. This was called the Forster Cup, and became the hotly contested annual prize for the life of the class. Frank Albert followed suit and donated a trophy, the Albert Gold Cup, for an invitation race to be held prior to the Forster Cup. However, mindful of promoting the sport of yachting across the nation, Forster stipulated that his cup had to be raced for in a succession of venues, not necessarily contested in the winner’s state. By this time the racing season was coming to a close, so the first of the official races for the 21-footers had to wait until early 1922. Sydney’s Port Jackson was of course the location of the first race, and by the time the official Deed of Gift was finalised (signed in Melbourne January 25, 1923) the succession of venues was set as Queensland, Victoria, Tasmania, Western Australia, South Australia and New South Wales. The deed also stipulated that only three boats were allowed to represent each state, selected by trials previous to the cup races. The inaugural Forster Cup contest was held over three races, on February 7th, 8th and 9th, 1922. A sixth NSW yacht had been built by then, and two came down from Queensland to race. Corella, the vice-regal entry, didn’t do too well in that first race. The Sydney Daily Telegraph reported Forster as ‘getting tangled up’ with Boomerang, Frank Albert’s boat, which lost her rudder. Interestingly the cup was won by Gumleaf, one of the Sydney designs from the previous year. Refinements within the restrictions were to evolve in the coming years, but the faster examples seemed to take the lead from these New South Welsh designs. In fact, although it had its roots on Port Phillip in Victoria, it could rightfully be said that the class has compelling reasons to call Sydney home. Victoria did not enter any boats in the 1922 races, contrary to expectation. It is possible that the Victorians were still refining their boats to fit in with the newly laid down restrictions. Idler, for example, originally had no bowsprit, and the original VYRA restrictions, it seems, limited sail area to 375 sq ft. When, however, the design was considered for the national racing class, bowsprits were accepted as standard and in the end the sail area was set at 450 sq ft.
One Saturday in the November following, at the slips of the Royal Sydney squadron, Forster explained to his crew that it was his desire, as he was also the commodore of the Royal Yacht Club of Victoria, that Victoria be represented by a strong boat. So he decided that Corella should represent Victoria in the next season’s inter-state championship series in Brisbane. The local Victorian boats, Idler, Namoi and Ardale, he said were not as modern as the boats built since in NSW or Queensland, while a new boat, Tahnui, has still to show form equal to the 21-footers of Port Jackson. The Victorians were, however, busy getting their fleet up to speed. Mitch Lacco, famous for the Couta boats of Victoria’s coastal fishing industry, also happened to be a keen racing sailor. His son Ken, renowned in his own right as a designer and builder, remembers his father regularly sailing Namoi for Vic Hornsby of the Port Melbourne Yacht Club, who co-owned the boat with its designer Charlie Peel. Having won several races in Namoi, and apparently impressed by the boat’s and her sister Idler’s performance, Mitch went home to Queenscliff at the southern end of the bay and set about building his own 21-footer. By this time (early 1922), the official national restrictions had been settled upon. ‘Dad built the Jessamine,’ Ken Lacco says, ‘but after completing her, even before he raced her, he went to Melbourne and saw a new boat called the Royalist – first of the new modern designs, which had originated in Sydney, that allowed for longer length at waterline when sailing. ‘But he had put a round bow on Jessamine,’ says Ken, ‘like the old type, and really he built her a year too soon. When the class really took off they built them with a straighter shorter stem and a long overhang forward.’ The name was inspired, Ken says, by a creeper (Jasmine) that grew over the fence from the yard next door. By the time of the 1924 Forster Cup races, held in Melbourne, 10 Victorian boats were ready for the selection trials. Lord Forster, ever keen to see the class take off around the country, sent his Corella down to represent Tasmania. NSW and Queensland were represented by three boats each. The Forster and Albert Cup contests were held in gale conditions in 1924. A NSW boat, Nettle, capsized and sank in a howling westerly while racing for a local prize previous to the cup races. But after resting on the bottom for two days, she was recovered, temporarily repaired, and went on to win the Forster Cup in a hard wind no more than two days later. Controversy over design was to continue for some years. Not very long after the establishment of the class, an article appeared in the respected and widely-read Australian magazine The Australian Motor Boat and Yachting Monthly. In the February 1926 issue, a critical appraisal of the 21s attempted to put into perspective the attributes of ‘design’ of the class, although it should never be forgotten that as a restricted class, the design could vary greatly within the set down restrictions. The measurements were made sans crew with regards to waterline length, draught and freeboard, so our critic was making the quite appropriate point that the additional weight of crew was, in his opinion, not put to good advantage in the designs of that time. In theory, they should have been designed, he wrote, as though they had unlimited overhang forward, with the excess cut off short, as it were, and bluntly finished. The point is conceded that this would make a very ugly ‘snout’ and a generally ‘mullet head’ bow, and the writer assumes that ‘it is perhaps the aesthetic eye of the designer that has prevented it being tried’. The truth was, however, that experimentation with bow and hull shape with regards to getting the most out of waterline length had already been tried. Royalist (pictured) was designed and built in 1923 for the Royal Yacht Club of Victoria and became the prize of a fund raising raffle. Designer and builder Jack McKenzie was following the lead of some of his Sydney counterparts when he built the boat with a long and low overhang at the bows, ending in the very ‘snout’ alluded to above. The same magazine in which the call went out for better design early in 1926 had, only four months earlier, described Royalist as ‘generally regarded as a freak boat, by reason of her departure from the ordinary features which it was understood this class would develop’. Royalist had, however, been scooping up a great deal of the prizes in her home waters, and yet it was conceded that she was ‘not the equal of some of the Sydney boats’. Of course there must have been some limitation to the advantage gained from an increase in weight. The restrictions allowed for a minimum, inside only, ballast of 10cwt, so that the extra ‘live’ ballast from the six crew must have been handy. But the maximum allowed deck length of 25ft must have put a limit on the waterline able to be gained from a heavy crew, and indeed the winning crews as seen in the available photographs do not really appear to be overly heavy (and with six on board, and with a cockpit restricted to no more than 42 superficial feet, there must not have been scope for too much dashing around). Brian Sullivan, who joined the Royal Brighton Yacht Club in 1938, and is an old hand from the 21 footer days, says he remembers that the ideal average weight of crew members was deemed to be 16 stone. Brian says that even then the older club members who sailed in the 1920s contended that even this was too light, and that 18 stone or more was normal, or desirable, in a crew member for a 21 footer. It is interesting to note that Helm’s assumed gain from the crew gives an average weight per person of a little over 10 and a half stone. Graham Jordon is a member of the Goolwa Regatta Yacht Club, south of Adelaide in South Australia, and also owns the 21-footer Altair. The club is something of a centre of revival for the 21-foot Restricted Class in Australia, has acquired about five so far, and is involved in re-starting interest in the class around the country, wherever boats turn up. Graham recalls that Harry Perry, a South Australian Forster Cup champion, had the reputation of being a ‘hard’ man. 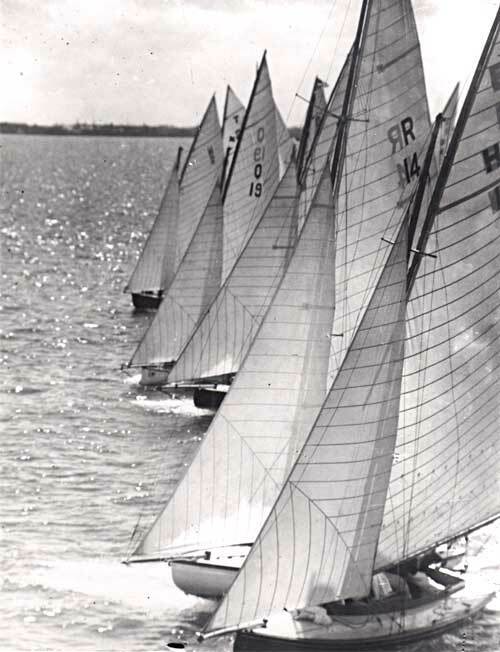 The gunter style of rig seemed to stay in vogue for years, as can be seen from a photo of the 1951 Forster Cup heats, but it seems that the Marconi or Bermudan rig had been tried years before. Another photograph (at right) shows the start of the 1930 Albert Gold Cup race on Port Phillip, with Topsy D (sail number R14) sporting a Marconi mainsail. That 20 years later the gunter remained the preferred rig can either be attributed to a stubbornness on the part of sailors or to the fact that, with the larger tolerances inherent in the rigging used over this time, the gunter really did perform just as well. Topsy D, by the way, did no better than most of the 1930 fleet, and in fact regained the gunter main after being sold to a Geelong owner. Daggar type centre plates came in for some tough criticism in 1926, being described as ‘the worst feature, totally unsuitable for the type of boat, most ineffective for their area, and cumbersome to work’. By this time, a lot of the boats were experimenting with either the daggar plate arrangement or a swing-plate. Most of the earlier 21s had plates that swung on a king bolt, ‘like a couta boat’, he says, but a lot had a daggar plate which just dropped down. ‘The Sydney boats came down here with daggar plates,’ Harry says, referring to the Forster Cup races held in Melbourne in 1924. ‘It took two men to work them, one to lift it and another to put the pins in to hold it wherever it was needed. And in Harry’s opinion, the boats with daggar plates were the best. ‘You could trim the boat for the wind, and with the case a couple of feet longer than the plate itself’ (and in some cases raked aft at the base to give a longer slot in the keel) ‘you could trim according to all conditions. The older boats tended to have the swing plate, but later that became the exception. When the 21 footers really took off, they all had the daggar plates,’ Harry says. The Idler Cup had been put up by the VYRA, named after the boat that started it all. Ardale, the first built under the then new restrictions, won the first Idler Cup in 1920, Namoi the next year, skippered by Mitch Lacco, before the Idler herself took out the prize. Royalist cleaned up three years in a row when she came on the scene after 1923, testimony to the turn of speed that the ‘new’ designs could achieve. Six crew these days may seem like many hands, but Harry says that everyone had a job to do. ‘There was the skipper, main sheet hand, the runner – I used to be on the runners when I was a kid. You’d let go the weather runner and go over the other side and tighten up the other one. And then there was the jib sheet hands and the forward hand. Everybody had a job,’ he says. One interesting example of club races for 21-footers started out as an impromptu race on Sydney Harbour, sailed for the first time on December 3, 1924. It became known as the ‘Admirals’ Race’ as two of the yachts had admirals of the Royal Navy at the helm. Admiral Lord Jellicoe, who had been commander-in-chief of the British Grand Fleet in the North Sea at the battle of Jutland in 1916, and had been Governor General of New Zealand, was passing through Sydney on his way back to England at the end of his term. He agreed to take the tiller of Forster’s Corella, even though he was more used to much larger craft. The other admiral was the new Governor of NSW, Sir Dudley de Chair, RN, who took the helm of another of the club’s 21-footers. ‘Instead of the brilliant brass buttons and gold braid to which he is accustomed,’ reported the next day’s Daily Telegraph, ‘he was introduced to a working crew clad in camping outfit of prison grey pants and loose necked shirts. No caps – no shoes – no socks – no belts!’ Someone whispered to him, says the newspaper, that as Forster’s crew invariably spent their Sundays at choir practice, there were heavy fines for nautical language. Much amusement was caused by some of the efforts of the other competitors to allow the admirals to distinguish themselves, under conditions unfamiliar to them. One boat collided with another, tearing the other’s mainsail, and one mile from the finish another boat’s spinnaker pole snapped, rumoured to have been broken across the skipper’s knee, to spare Jellicoe the humiliation of finishing last. But the strategy, if true, did not work. The boats that hit were fined one mouth organ, for fouling the other, and one tin of biscuits, for having been fouled. Jellicoe was quoted in the press report as saying: ‘They are comfortable little ships. I hope to participate in another contest and am confident of doing much better.’ For stating this he was fined two brass buttons, and de Chair was fined a fourth of a pint for having come fifth. By the time the 1925 series arrived, held in Hobart, the Tasmanians had built themselves a boat that was to prove the undoing of many contestants in these races and in the years following. The building of Tassie started on December 18, only six weeks before racing the next February. It was said that it was such a rush job that there was not enough time to get properly seasoned huon pine. Indeed, the Hobart newspaper The Mercury reported on the day after the first race that Tassie was ‘still so new as to be spilling the caulking from her seams almost every time she takes the water’. 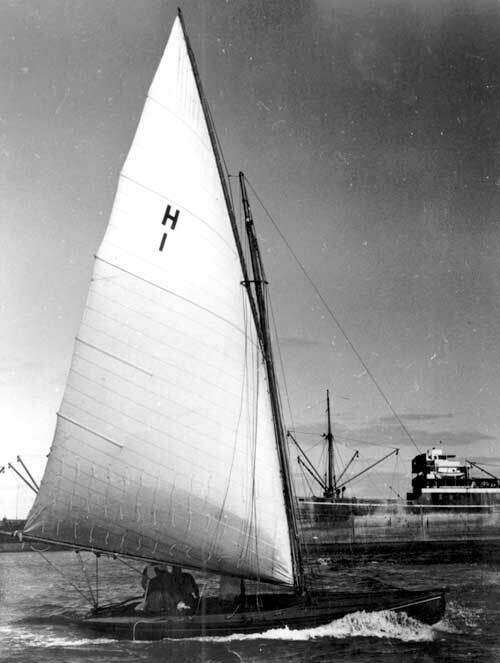 She was given very little chance by the other competitors and was described as a ‘rough huon pine yacht’ compared to the highly finished hulls of the other boats, and yet Tassie proved the ‘experts’ wrong, and went on to win convincingly every heat of the Forster Cup series that year. Tassie in fact won every Forster Cup for the next five years. In this spectacular way, Tasmania came on to the 21-footer scene and in fact went on to 16 victories over the next 30 years of competition. The 1930 races were held in similar conditions to those experienced in 1924. Harry Clark was out in Topsy D. ‘I remember we had three reefs down and no headsail, and we still couldn’t hold her,’ he says. ‘The wind was 60 mile (an hour) and I don’t know what it was gusting to. And you weren’t allowed to tie up once the race started, but you could anchor to reef down or change sails.’ The final heat was swept by a gale so fierce that nine of the 11 starters were forced to retire, and only two finished, both being NSW boats. Three NSW boats were sent down to Melbourne for the 1930 sailing carnival, named NSW1, NSW11 and NSW111. These boats were built under the auspices of the Yachting Association of New South Wales and were financed by public subscription. This method of ownership had been successful in Tasmania, as Tassie as well as the subsequent Tassie Too (subs: yes! Tassie Too) and Tassie 111 were all built and equipped by subscription to a fund set up specifically for the purpose by the Royal Yacht Club of Tasmania. Finance was wholly supplied by the sport-loving people of Hobart. Public interest in Victoria was very keen, even in the last few years of the life of the class. In 1947 the Royal St Kilda Yacht Club asked its members to contribute to a fund for the building of a new challenger. The appeal was over subscribed within a fortnight. On the night of the presentation of trophies in 1930 at the St Kilda club, a significant event took place in the form of a toast from Lord Forster. He was at that time back in England, but of course knew of the up-coming championships beforehand. But thanks to the happy thought of an associate, a Mr Anderson, Forster had made a gramophone recording that he sent over to Australia, on which he sent his best wishes in a brief speech and the toast he had apparently made before: ‘Here’s to the little boats with sails; good luck to the men who sail them!’ The one-sided shellac disk was played every trophy night at St Kilda for some years until it was unfortunately broken. New South Wales last competed for the Forster Cup in 1934. ‘From there on the class virtually disappeared in Sydney,’ Don says. ‘Many of the yachts were converted to cruising boats, with keels and self-draining cockpits.’ The class survived better elsewhere, which Don tends to put down to the yachtsmen being perhaps ‘made of sterner stuff … less concerned about vice-regal patronage and more interested in racing’. But the contests for the 21-footers continued unabated in other states. Racing at Brisbane in 1939, the last before the war interfered with interstate races, was a close contest. Royalist won the first heat, Tassie Too the second and a Queensland boat Dolphin the third. The destination of the cup was in doubt until the last leg of the deciding race, where at one stage there was every possibility of a triple dead-heat between these three boats. But Tassie Too nudged forward to secure the cup again. Compliance to the restrictions allowed for some scope within the rules, as in the case of bow shape. The limit set for ballast dictated that no less than 10cwt had to be carried inside the boats. ‘This was usually done by carrying ingots of lead that were distributed around the bilge as seen fit by the skipper,’ says Graham Jordon in Adelaide. ‘However, a lot of the 21s carried far more than 10cwt. Tassie Too carried 14cwt, but apparently many carried as much as 30cwt. ‘There was one boat called Lady Alice, which was built especially for the Forster Cup races in Adelaide in 1927, that carried four tons of concrete. This was cast directly inside her bilges,’ he says. ‘She didn’t do all that well however. The unusual name of 1820, by the way, came about because the original owner, Jim Douglas, who ordered the boat in 1933 to contest in the cup races in Sydney the next year, was a local manager for Johnnie Walker, and 1820 was the name of one of its lines of whiskies. Could this be one of the earliest examples of corporatisation of the naming rights of yachts? The 21-footers were also handy as a general knockabout boat, a characteristic the early proponents of the class saw as desirable in creating a racing boat that would appeal to a wider audience. The Australian Motor Boat and Yachting Monthly carried a report in its May 1926 issue about a Moreton Bay (Qld) owner who, after racing on a Saturday, left for a fortnight’s cruise on the next Monday with his wife. Carrying her second racing suit of sails, and fitted with a detachable coach-house, two bunks, galley and collapsible dinghy, the boat returned from the successful cruise around the bay and was racing again at the very next meeting. 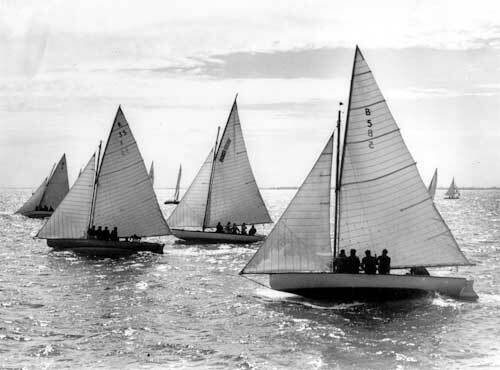 One attempt was made in the early 1960s at the Royal Melbourne Yacht Squadron to get the class racing again. Nine boats were soon racing together, including many names made famous in the class’s heyday. But this lasted only until 1965, when the class finally dispersed forever.